The block diagram of a system that uses a digital filter to remove an SNOI and retain the SOI is shown. This system assumes that the signals originate in continuous time and, after filtering, are returned to the continuous-time domain. The analog-to-digital converter (ADC) and digital-to-analog converter (DAC) interfaces represent how a real-time system is configured; but later, when simulating this system, you’ll use wav files to process prerecorded speech (the dashed lines). From this point forward, assume that noise is negligible and drop w(t) from consideration. 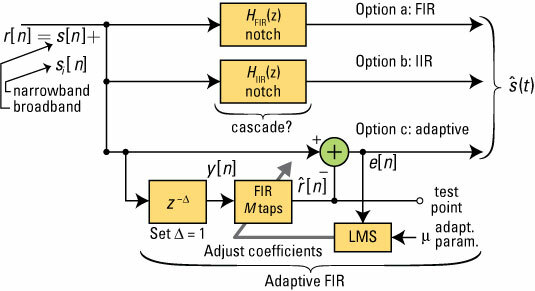 Consider the finite impulse response (FIR), infinite impulse response (IIR) and adaptive FIR filtering options shown. You can find the coefficients through convolution of second-order numerator and denominator coefficient sets. The adaptive filter is more exotic. This filter is an example of a time-varying linear system. Don’t worry about fully absorbing the math behind this filtering system/algorithm right now. The intent here is to provide you with a general sense about its operation, inspiring you to study this topic further at some time in the future. 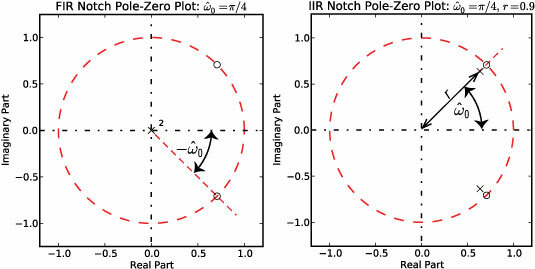 Unlike the FIR and IIR notch filters, the adaptive filter adjusts its coefficients to form a passband response (shaped as a band-pass) at the location of each interfering tone. 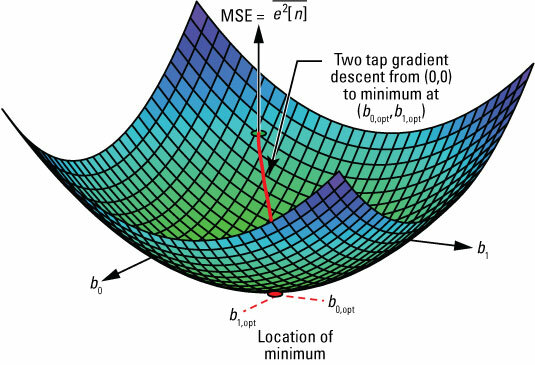 Giving the filter a large number of taps (or degrees of freedom) allows it to form multiple passbands if needed. It does this on its own, without any prior information! Upon convergence of the LMS, the output tends to contain only the SNOI, which is one or more sinusoids. The error output is the (SOI + SNOI) – SNOI = SOI. An estimate of the SOI is exactly what you want, but this filter is more complex. Also, if the SOI by chance contains steady tones, the adaptive filter does its best to remove them. Eliminating desired tones from your SOI is likely a showstopper. The filter coefficients utilized at time n are am[n], for m = 0, 1, . . ., M.
The parameter μ is known as the convergence parameter. If μ is too small, then filter convergence is slow; but if it’s too large, then the algorithm becomes unstable. An approximate upper bound on μ is 1 / [(M + 1)Pr], where Pr is the power r[n]. As initial conditions, set all the filter coefficients to 0. For a two-tap FIR, you can view the steepest descent as it’s shown. Each update of the LMS algorithm moves you on average toward the bottom of the error surface, thus minimizing the MSE.